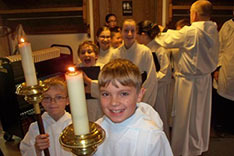 Acolytes are those who assist the clergy during worship by carrying the processional cross and candles, and serving at the altar. All persons 10 years of age and older are invited to participate in this ministry. Training is provided. For more information, contact Lee Eaton (860-649-0507) or the church office. The Altar Guild prepares the altar and church for liturgical services and cares for the vestments, altar vessels and hangings. Members skilled in floral arranging prepare each week's altar flowers. At St. Mary's, Altar Guild members are arranged in teams. Each team serves for a month at a time, every four months. Both men and women are encouraged to serve in this important and rewarding ministry (training is provided). For more information, contact Jean Kelsey (860-643-5718) or the church office. These are lay people who administer the chalice of wine during communion. Eucharistic Ministers are licensed by the diocese. These are lay people who read the designated scripture and lead the Prayers of the People during worship. A schedule is distributed each month to all Eucharistic Ministers and Lectors/Intercessors. This schedule (also referred to as the Liturgical schedule) identifies the dates and times each minister of the service is scheduled to serve. If you are interested in serving as a Eucharistic Minister or Lector/Intercessor, please the church office. Ushers greet worshipers, distribute service bulletins, collect the offerings and respond to needs that arise during time of worship. They also play an important role in welcoming visitors. Contact the church office if you are interested in serving in this ministry.